Wayland's 'Look Inside' series is well established; with these two titles there are now six books, all by Moses, on national curriculum topics for junior schools. The idea of the series, with its key-hole logo, is elegant. Each book begins with an historical tableau: the deck of a warship or the shop floor of the mill. Each element is highlighted - the mill owner offers the worker a wage token; in his other hand he holds an indenture; on the wall there is a clock and a warning sign about the dangers of mill machinery. This is, in effect, the contents page and the dozen topics which are indicated each have a double page spread devoted to them subsequently. Moses has read widely and writes clearly. The format is generous with contemporary prints and photographs, and eyewitness quotations (many of them footnoted, something unique in a book for this age group). And where there is rich evidence, like the treasure trove from the Mary Rose displayed in Tudor Warship, the past emerges in all its complexity. In some of the other books in the series, the reliance on the opening freeze frame to organize the book has lead to the introduction of information in unlikely places (a poor index does not help). This is not such a problem in these two titles, although there is still awkwardness. 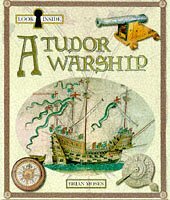 There is difficulty, too, with discussing change and variation: the Tudor warship was different at the time of the Armada from the time of the Mary Rose, and a Spanish warship was different from an English warship. In the Victorian titles in particular, there is another problem - the impression, exacerbated by some dramatic scene setting by Moses, that the past was benighted. The industrial revolution made the nineteenth century a difficult time to live in for most people. But it was also a time when there was greater recognition of social injustice and an impetus for change (many of the sources that Moses uses are the voices of reformers). Victorian Mill deals with this rather better than the earlier Victorian Schoolroom, and there is space for enlightened mill owners, although only a paragraph for trade unionism. The glory of the series, however, is the way it plunges children into the thick of history and beguiles them with the strangeness of another time, rather like a visit to an imaginative working museum.